This is a round Columbia Bicycles porcelain sign. This particular Columbia Bicycles sign is red, maroon, and blue. 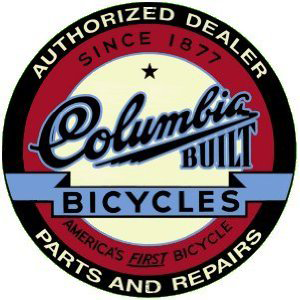 It reads, “Authorized Dealer, Since 1877, Columbia Built Bicycles, America’s First Bicycle, Parts and Repairs” and features a black border.